FINDING CLUBS IN CT & NYC: “I visited your website to see whether there is any go community in NY City or Connecticut,” writes reader Toshi Bekku. “If there are, do you have their contact information?” Click here to find local clubs anywhere in the United States. Enjoy! MARIGO RECLAIMS ITALIAN TITLE: Francesco Marigo 4d from Milano regained his Italian title, when he defeated opponent Carlo Metta 1k in his hometown Pisa twice and took the 2009 title (the first game was held last year) 3-0 on Friday, March 5. Marigo held the title from 2001-2006. Viktor Bogdanov 5d of Petrozavodsk (Russia) won the Firenze (Florence) Open, held last weekend in Colleoli, a village in the green hills of Toscany. MARZ BEST AT BST-MEISTERSCHAFT: Manja Marz 4d of Marburg won the combined Meister(in) title of Brandenburg, Saxony and Thüringen states. Last weekend in Leipzig (Saxony) Marz stayed ahead of locals Jens Henker 4d and David Schmidt 1d . Manja is married to Micha Marz 3d, President of DGoB. Click here for results. GONZE GOES FOR BELGIAN TITLE: With current Belgian Champion Lucas Neirlinck 4d not defending his title, François Gonze 3d grabbed his chance. In the first weekend of the round-robin with 10 last weekend in Brussels, Gonze won all four rounds, with three close behind at 3-1: Jan Ramon 4d, Thomas Connor 3d and Pieter Beyens 2d. The second and final playoff is set for March 21-22. SURMA AND NG EURO YOUTH-CHAMPS: Mateusz Surma 4d (Poland) won the under-16 European Championship and Anson Ng 1k (UK) took the under-12 title in Sibiu, Romania, March 4-7. Surma and Ng will represent Europe at the next Goe World Youth Championships. Mihai Valentin Serban 4d (RO) won the under-18 and Christian Pop 7d the side event over the weekend. Saijo Masataka 9P was the top special guest at the jubilee 15th Youth-EC. Next was his student Catalin Taranu 5P, now President of the Romanian Go Association and the third guest was Csaba Merö 6d (Hungary), winner of the first Youth-EC back in 1996 in Baile Felix, Romania. The three categories attracted a record number of children, 75 in the under-12, 48 in under-16 and 13 in under-18, while 40 grown-ups took part in the Open tourney. EuroGOTV broadcast video and games on KGS. HWANG SNAPS UP BIG CHEESE IN HARBURG MOUSETRAP: Hwang In-seong 7d from Berlin took home the top prize in the March 6-7 “Mausefalle” (‘Mousetrap’, is German for ‘snapback’) in Hamburg-Harburg. A large field of 112 players turned out from 37 German clubs. Hwang joins current Deutscher Meister Christoph Gerlach and Benjamin Teuber as two-time winners. Only Cho Seok-bin 7d has won the Mousetrap three times. Local veteran Stefan Kaitschick 5d finished second, losing only to Hwang. Local hopeful Timo Kreuzer 1k was undefeated, as was Olaf Engel 5k from Flensburg. The former received a thick luxury go-ban as special prize for best youth, while Olga Silber 1k earned her a set of luxury stones as best woman with 4-1. Top winners got money prizes, others got books. Click here for full results. SILT SWEEPS IRISH CONGRESS: Ondrej Silt 6d from Czech Republic overcame the opposition of Wang Wei 7d, winner of last year’s Irish Congress in his hometown Cork. Silt won the Irish Open 5-0 in the Teachers Club at the heart of old Dublin last weekend. Wang was second, while Willem Mallon 4d and Willem-Koen Pomstra 5d (both of Holland) shared third place. Also Kim Ouweleen 2d (NL) and Quentin Mills 4d (UK) won 3 each. Click here for the full results. At the rapid handicap tourney, the Friday before, Edwin Brady 2k (UK) had best sos. Also Justyna Klaczar 3k (PL), Pomstra, Bernd Sambale 1k (D), James Hutchinson 1k (UK) and Ouweleen won 4-1. Click here for the full results. MARIGO CAMPIONE ITALIANO: Francesco Marigo 4d from Milano regained his (2001-2006) Italian title for 2009, when he defeated his opponent Carlo Metta 1k in his hometown Pisa twice and took the title 3-0 on Friday, March 5. The first game had been last year. Viktor Bogdanov 5d of Petrozavodsk (Russia) won the Firenze (Florence) Open, held last weekend in Colleoli, a village in the green hills of Toscany. MARZ BEST AT BST-MEISTERSCHAFT: Manja Marz 4d of Marburg won the combined Meister(in) title of Brandenburg, Saxony and Thüringen states. Last weekend in Leipzig (Saxony) she stayed ahead of locals Jens Henker 4d and David Schmidt 1d . Manja is married to Micha Marz 3d, President of DGoB. Click here for the results. GONZE GOES FOR BELGIAN TITLE: With current Belgian Champion Lucas Neirlinck 4d not defending his title, François Gonze 3d grabbed his chance. In the first weekend of the round-robin with 10, last weekend in Brussels, he won all 4. Three follow him at 3-1: Jan Ramon 4d, Thomas Connor 3d and Pieter Beyens 2d. Second and final part is up for March 21-22. Gonze still has to play all three at his heels. CHEN DOMINATES DRESDEN: Chen Lei 6d easily swept the 23rd Dresden tournament 5-0 on February 27-28 in Germany. Runner-up Marc Landgraf 3d lost to Chen and Thomas Hübner 3d took third. Click here for results. SIMEUNOVIC SWEEPS SAMAC: Zoran Simeunovic 5d swept the fifth annual tournament in Samac, Bosnia the last weekend in February. Dragan Barisic 5d, also of Bosnia, was second and Robert Jovicic 3k from Zagreb (Croatia) came in third. The other three players from Zagreb — Mato Tausan 9k, Fran Pejonic 11k and Filip Pejonic 13k also won 4-1. As Rado Babic 12k of Austria reported, the tourney featured 25 players from 8 clubs in 4 different countries. Click here for results. BLOMBACK BANKS VAESTERAS: Scandinavian Champion Fredrik Blomback 5d (Stockholm) flowered at the Open Champs in Vaesteras, Sweden the last weekend of February, sweeping the event 5-0. Martin Li 5d of Falun and Charlie Akerblom 4d of Norrköping lost only to Blomback and also made the podium. Jakob Bing 2k, Robert Aahs 4k and Robin Nilsson 11k won 4-1 as well. In Vaesteras 28 took part. Click here for results. MGE-1 HUNGARIAN TEAM CHAMP: The MGE-1 team, captained by György Czismadia 4d, narrowly won the Hungarian Team Title, staying half a point clear of Origo under Zoltán Fódi 1d in the final round. While Origo crushed PaGoda-2 8-1, they defeated PaGoda Agro by only 6-3; half a point more (jigo is possible with 6 komi) would have tied them with MGE-1. Winners were awarded cash prizes and champagne. The student team of PaGoda-1 — Alexandra Urban 1d, Júlia Seres 1k and Péter Markó 2d — won bronze. Click here for the detailed results. HUNGARIAN SCHOOLKID PRELIMS: The preliminaries of the Hungarian Championship for schoolkids kicked off February 19 in Hejokeresztúr in the East of Hungary, where 45 kids played, mostly on 9×9 and 13×13. “There were lots of age groups, lots of medals, lots of happy kids,” reports Péter Korossy. The next day, 18 played round-robin in three age-groups in Pápa in the West and the following week in Szigetszenmiklós in central Hungary, 14 took part on February 26 and 24 a day later in Budapest, at the the “Rabbity Six” tourney (see last week’s news). For results, click here – for photo links, click here “The finals are up for May in Budapest, where most of Hungarian go-life is concentrated,” adds Korossy. EURO GO DATABASE TO REACH HALF A MILLION: The European Go Database lists over 26,000 players in almost 5,500 tourneys with almost half a million games as well as more than 400 game records and over 300 player pictures. Over 300 also appear in the new American Go Association Game Database. Click here for current standings. LEE CHANGHO WINS KBS CUP: Lee Changho 9P notched his 11th KBS Cup title win on March 4, defeated Kang Dongyun 9P by resignation to win the title 2-0. This is Lee’s first title win of the year. CHO U WINS GAME 1 IN JUDAN: Cho U (Judan) defeated Yamashita Keigo (Tengen) by resignation in the first round of the 48th Judan-sen on March 4. This is Cho U’s third Judan title match since 2004. He lost the title match to O Rissei (3:1) in 2004 and won the title against Takao Shinji (3:1) in 2009. This also is Yamashita Keigo’s third Judan title match. 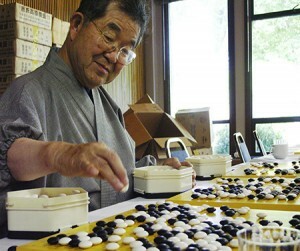 He lost to Cho Chikun in 2006 (3:1) and in 2007 (3:2). The 2nd round will be played on March 25th. KONO RIN WINS NEC CUP: Kono Rin 9P took the NEC Cup from Hane Naoki on Saturday, winning the final game of the 29th Cup by resignation. This is Kono Rin’s second NEC Cup title win; the first was in 2008 against Cho Sonjin. LEE CHANGHO WINS ROUND 1 IN KUKSU: Lee Changho 9P defeated Hong Kipyo 4P by resignation in the first round of the 53th Kuksu title match last Saturday, March 6. This is Hong’s first national title match; he was 43rd in the Korean professional standings in 2009. 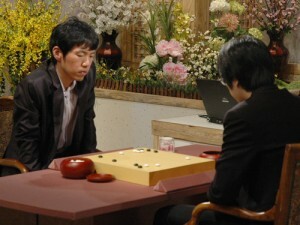 The Kuksu is Korea’s highest Baduk title, the winner of which is commonly considered to be Korea’s strongest player. 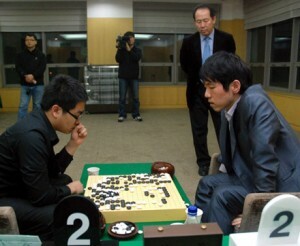 Last year’s Kuksu champion was Lee Sedol. Round 2 will be played on March 17th. GU LI SUFFERS ANOTHER DEFEAT: Gu Lingyi 5P defeated Gu Li 9P by resignation on Sunday in the quarterfinals of the 10th RICOH Cup. This was the second straight tournament loss by Gu Li in the three days (see GU LI, KONG JIE ELIMINATED FROM CCTV CUP below). Mid-level dan players have been showing their strength as of late, giving 9-dans a run for their money. At just 18, Gu Lingyi is one of China’s rising stars, reaching China’s top ten this past August. The RICOH Cup semifinals will pit Wang Lei 8P against Kong Jie 9P and Gu Lingyi 5P against Xie He 7P. GU LI, KONG JIE ELIMINATED FROM CCTV CUP: Top players Gu Li and Kong Jie went down to defeat in the CCTV Cup last week as Zhong Wenjing 5d eliminated Kong Jie in the first round on March 4 and Zhang Wei 6P defeated Gu Li 9P by resignation in the second round on March 6. Kong Jie was last year’s CCTV Cup winner and was expected to defend his title in the final round. Gu Li was the second of China’s top players to be eliminated by mid-level dan players. Of the eight players left in the tournament, three are 9 dan and the remaining five are either 5 or 6 dan. At least one of these mid-level dan players will advance to the final. XIE YIMIN WINS ROUND 1 IN FEMALE MEIJIN: Xie Yimin (Female Meijin) defeated Mukai Chiaki 4P by resignation in the first game of the 22nd Female Meijin on March 3. The second round will be played on March 10th. PARK YEONGHUN ADVANCES TO MAXIM CUP SEMIS: Park Yeonghun 9P defeated Yoo Changhyuk 9P by half a point in the third round of the 11th Maxim Cup on March 3. He will face Choi Cheolhan, the current Maxim Cup title holder, in the semifinal. CHINA’S MENG WINS STUDENT OZA: Meng Xiao-long of China defeated Seo Yutae from Korea in the final of the 8th World Student Oza Championship, held March 1-3 in Tokyo, Japan. The Americas were represented by Argentina’s Gabriel Benmergui, who finished 2-2 and Mexico’s Emil Garcia, who went 1-3. Europe’s Artem Kachanovsky (Ukraine) went 2-2 and Anna Prokopova (Czech Republic) finished 0-4. Click here for the results and the game-record of the final. KARLSBERG BREAKS SHIKSIN’S WINNING STREAK IN KGS INSEI LEAGUE: Russian Women’s Champion Elvina Karlsberg finally broke KGS Insei League (KILL) co-founder Ilya Shiksin’s 199-game winning streak in the B-E divisions. Karlsberg beat Shiksin by half a point in a 6-player simul on March 3, collecting the prize of a collection of trick moves. Click here for the game. Results from the February League: A League: danigabi (Argentina) swept the title 13-0, ahead of artem92 (Ukraine) 11-1. B: Latmir (Ru) 7-1, Maroncsan (Hu) 11-3, Teamrocket (NL) 11-4 (all 3 moved up to A). C: azorod (Ru) 1-0, Sinprejic (US) 7-3. D: DarkArhont (Ru) 7-1, Badukboris (Germany) 7-3. E: Srgej (Ru) & lighthouse (Ger) 14-2. MILLING, BOEHEM & HADDAD TOP AUSTIN WILDFLOWER CLASSIC: Chris Milling 4k, William Boehem 9k and Geoffrey Haddad 20k shared top honors at the March 6 Wildflower Classic in Austin, TX. The three emerged undefeated 4-0 to top the 24-player field, reports TD Andy Olsen. Photo by Steven Morris. ZHANG WINS MONTREAL WINTER TOURNEY: Hanxi Zhang 6D of Ottawa won the 31st Winter Tournament on February 28. The one-day, three-round event, officially known as the Tounoi d’hiver, was held at the Jean-de-Brébeuf College, in Montreal and attracted 41 players. Winner’s Report: Group A: Hanxi Zhang, 6D, Ottawa; Group B: Jean-Sébastien Lechasseur, 4D, Quebec; Group C: Ying-Chu Chen, 1D, Montreal; Group D: Aida Harumitsu, 5K, Montreal; Group E: Timon Sun, 18K, Montreal. CHEN & YUAN WIN NJ OPEN: ZhaoNian (Michael) Chen 7d, Zhi Yuan (Andy) Liu 7d shared top honors and New Jersey State Co-Champions last weekend, winning $300 each. 115 players turned out one of the strongest fields on the year at the 51st annual tournament February 20-21 in Princeton, New Jersey, organized by the Princeton Go Club. 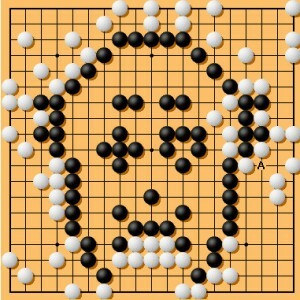 The E-Journal broadcast the Board 1 games live on KGS to crowds that topped 500 for the final showdown for the final round game between Chen and Yuan. The game records can be found on KGS under usgo1; a game commentary for the EJ by Alexander Dinerchtein on the final round game is attached. 5-game winners ($100 each): William Lockhart 6d, Justin Teng 4d, Huang Sida 2k, Brian Aronson 3k. 4-game winners ($60 each): Kevin Shang 5d, Jared Beck 4d, Li Shi 1d, Brandon Langley 2k, Amy Su 5k, Kim Ilhee 6k, Iris Lin 9k, Adam Newshan 14k, Joanne Huang 17k, Robert Cole 19k, Jessica Huang 21k. Beginner (15k and below) random drawing for a complete go set: Jonathan Hong. Paul Matthews and Rick Mott directed the tournament. MINGJIU JIANG 7P TO REP N.A. AT CHUNLAN CUP: Mingjiu Jiang will represent North America at the North American Chunlan Cup after defeating Feng Yun to win the qualifier Sunday night on KGS. In the first round earlier in the week, Mingjiu Jiang won over Calvin Sun, and Jie Li won over Jason Gu. Feng Yun received a bye when her opponent could not meet the schedule. In the second round, Jie Li 7D had to withdraw due to his law school school schedule, leaving Feng Yun and Mingjiu Jiang to battle it out.The sponsoring Chunlan Group is a large conglomerate of electrical, electronic, and mechanical manufacturing companies, headquartered in Taizhou, China. In 1999, Chunlan began sponsoring a world go championship, first as an annual event, then as a biannual event beginning in 2001. With a top prize of 1 million yuan (about $150,000USD), the Chunlan Cup is comparable in size to the Fujitsu, LG, and Samsung Cup. For the 8th Chunlan, 16 top players from around the world have been invited to participate in a knock-out that will begin in late March, and continues through the rest of the year until concluding with a final 3-game series in June 2011.Korea leads the Cup so far with four, Japan has one win, and China has won the last two. Jimmy Cha represented North America in 2008 and won his first round against Imamura Toshiya 9P from the Kansai Kiin, but lost to China’s Huang Yizhong 7P in the second round. Alexander Dinerchstein played for Europe and lost in the first round. 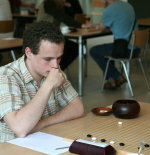 RUECKRIEMEN WINS VT TOURNEY: Rolf Rueckriemen 2k won the February 13 From the Word Go tournament in in Middlebury, VT. There were 12 players from Vermont, New Hampshire, and Massachusetts. Wnner’s Report: 1st: Rolf Rueckriemen 2k (4-0); 2nd (tie): Adam Luter 1k (3-1) & Lihu Ben-Ezri Ravin 4k (3-1); 4th: Henry Danaher 2k (3-1). Peter Schumer directed. FIRST-TIMER SHIN WINS GOLD AT GROESCH MEMORIAL: First-time tournament player Joe Shin took home top honors at last weekend’s John Groesch Memorial. 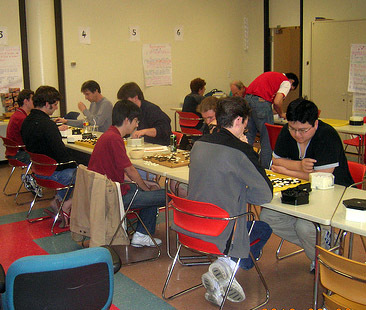 The 4-round tourney was held on February 20 in College Park, MD and attracted a dozen players. Zarathustra Goertzel also finished 4-0 and won the kyu prize. The John Groesch Memorial prize for the best performance by a player under the age of 20 who is new to tournament go (defined by less than two years of tournament play) was won by Alexei Avakov with 3 points. Steve Mount directed. YAMASHITA STAYS ALIVE IN KISEI: Yamashita Keigo managed to avoid a sweep by defeating Cho U by 7.5 points in the fourth round of the 34th Kisei. It will be an uphill battle for Yamashita to retain his title, with Cho U leading 3-1. Round 5 will be played on February 18th and 19th. KONG JIE WINS ROUND 1 IN THE LG CUP: Kong Jie defeated Lee Changho by 2.5 points in the first round of the 14th LG Cup title match. This is Lee Changho’s sixth appearance, winning four of his five LG Cup title matches. The last time Lee Changho played as a finalist was in 2004. This is Kong Jie’s first appearance. The second game will be played on February 24th. KANG, PARK & HEO ADVANCE IN CHUNLAN CUP PRELIM: Kang Dongyun, Park Yeonghun, and Heo Yeongho each won their respeective games in the preliminary tournament of the 8th Chunlan Cup and will advance to the next and final round. LEE YOUNGGU ADVANCES IN CALTEX CUP CHALLENGER: Lee Younggu 8P defeated Park Seunghyun 6P by 1.5 points in Round 2 of the 15th GS Caltex Cup Challenger Tournament. The winner of the Challenger Tournament will face Cho Hanseung 9P, the current Caltex Cup title holder. XIE BLANKS UMEZAWA IN FEMALE KISEI: Xie Yimin defeated Umezawa Yukari by resignation on January 28 to sweep the Female Kisei 2-0. Xie now has the distinction of holding all three of Japan’s female professional titles, the Kisei, Honinbo and Meijin, as well as the Daiwa Ladies Cup. MYUNGWAN KIM 9P WORKSHOP SET FOR BERKELEY: The Bay Area Go Players Association will host a workshop with Myungwan Kim 9P March 20-21 in Berkeley, CA. “Because of some generous donations the entry fee is just $50 for students under 23 and $90 for those 23 and over,” says Roger Schrag. The first pro sent to the U.S. by the Korean Baduk Association, Kim came to the Los Angeles area in June, 2008. He won the US Go Congress Open in 2008 and 2009. Today Kim – who was promoted to 9 dan about three months ago — runs a Go Academy in the Los Angeles’ Korean Go Club, teaching roughly three times per week. Click here http://www.bayareago.org/workshop3.html for details and to register. TEACHER OF THE YEAR NOMINATIONS OPEN: Nominations are open for the AGF Teacher of the Year, an excellence award that comes with an all-expenses paid trip to the US Go Congress. To be eligible, a teacher must be a member of the AGA, have been teaching Go to children for at least two hours a week for two years, and have helped kids enter any available tournaments. In recent years, winners have far exceeded these requirements, some running several programs at once. Click here <http://agfgo.org/teacher.html> for more information. To nominate someone for this award, including yourself, please write to agf@usgo.org. The deadline is March 31. TURN-BASED GO APP RELEASED: The new Boardz is a different way to play go online on the iPhone and iPod touch. “Games played on Boardz are turn-based, meaning you can play your moves whenever you wish,” says Boardz author Christopher Maughan, “you don’t need to stay online until the game is finished.” Boardz also features authentic ‘shell’ stone and wooden board graphics, as well as smooth animations. Full territory statistics are shown at the end of the game, and you can play with friends or random opponents on 9×9, 13×13 or 19×19 boards. Search the app store for ‘Boardz’, or you click here http://www.snarlsoftware.com/boardz for more information. Boardz is $2.99, and in addition to go, can play shogi, XiangQi and chess. SMART GAMES ADDS IGOWIN LIFE APP: One of the fastest ways to get stronger at go is to practice life and death problems. David Fotland’s new Igowin Life gives you problems at your level, whether you are a 25-kyu beginner or a dan-level expert. The app plays against you as you solve each problem. It quickly learns your strength and gives you problems that challenge you to improve your skills. Igowin Life is available now in the iTunes application store for the iPhone, iPod Touch, and iPad. This app ports the “Solve Go Problems” feature from The Many Faces of Go. Over 2000 problems are included, graded by difficulty from 25 Kyu beginner problems to difficult Dan level problems. Problems are shown in various orientations or with colors reversed, giving over 32,000 combinations. A magnifying glass lets you precisely choose your spot to play. Search the app store for Igowin to find all of the Igowin applications. Several more will be released in the next few months.